I need a new guitar...but I don't know what I want. Discussion in 'Guitars in General' started by humbert, Oct 24, 2008. I'd been a dedicated Les Paul player for the past seven years (and I've only been playing for about ten, since high school), and although our relationship was tenative at times (a lot of pickup switches), I thought there was a lot of love. I'm really sick of the flabby, overly middy, indistinct tone I get through my Dual Showman with this guitar. This thing sounds pretty nice with pedals. It even sounds pretty damn good through some other amps. But it's not me. Tried some semi-hollows (ES-335 and Duo-Jet). Too flabby with distortion. Gorgeous cleans. Tried some Fenders. Great tonal balance, but ultimately too polite. Tried a Mosrite. Killer tone, but the most awkward neck ever. Tried an SG. I hate SGs. But these sounded great! Even better with p90s! However, I couldn't get behind the control layout and awkward, heavy neck. So what do I really want? I've got about a G-and-a-half to spend. It would be nice if it had humbuckers (so I could mount my pickups, an SD phat cat and a Fralin Unbucker). It's gotta be able to mount a Bigsby. Teles are still on with a neck shim. I want a balanced, powerful tone. That "complexity" that semi-hollows have is great! But they kind of wuss out on the "focus" when they get distortion on. Single coils are a must. The tone I'm going for here is Blixa Bargeld on Nick Cave's "I Let Love In". But a more common example might be Nokie Edwards' 60's Ventures tone. Plus a bridge pickup sound more in the Neil Young/Black Sabbath ballpark. A tele. It does it all from beefy to sweet to twang... Really. honestly, try a PRS. i swapped out the stock buckers on my Custom 24 for Dimarzio Virtual PAFs. it might be the perfect combo. classic humbucker tones without the mud. so you currently have a phat cat and unbucker in your Paul? and want to get rid of the middy tone you get from a strong signal when played clean? Have you thought about pickups that have a lower wind, like down to 7.1K, which is in the range of a mini-bucker? Or maybe even lowering your pickup height? Couldn't hurt to work a bit more with your Paul, it's a tried and true platform. if you really want super spanky clean and a totaly 180 from a Paul, you can try a Strat with genuine single coils, or a Tele with a vintage wind single coil setup - put those through your Dual Showman and I doubt muddy mids will be an issue anymore. My Bowery Tele has a Firebird pickup in the neck and an Area T in the bridge, and the middle position is free of gunk and can funk out. The bridge is classic rip, no mud, and the neck is dark but clean. There's just something about a Tele that's different than a LP, or Strat. Never played a tele until I picked this up about a month ago. All I can say is WOW! After reading your post the tele was the first thing that came to mind. Have you thought about pickups that have a lower wind, like down to 7.1K, which is in the range of a mini-bucker? Or maybe even lowering your pickup height? Couldn't hurt to work a bit more with your Paul, it's a tried and true platform. I'm in agreement with this post. And I don't see Black Sabbath coming out of single coils. Maybe you should consider some coil tapped buckers to get the other tones you want. Also, if the guitar sounds better though other amps, maybe you should look into tweaking the Showman. Lots of posts here about tweaking Fender amps, something as simple as a preamp tube swap could help. What appeals to some players doesn't necessarily fit in with what another player's perfect guitar is, so I really read your list of what you liked and didn't like about different guitars, and I may have a suggestion. I'm assuming that you find the shape and balance of a Les Paul comfortable, so I'm pointing you at a single cut instead of a double cut. You like the clarity of some single coils, but want more balls, so that leans me towards P90's. Single coil clarity, but dig into them and you get more rudeness. If you want a trem, or you like the thicker neck of a Les Paul, the CU22 Soapy has a thicker C neck than the regular 2 pickup soapbar. The 5 way with the 3 different P90's allows some great combinations of clear and punchy tones. May have to try out some Teles--and shim the neck up for a Bigsby. I got a lot of PRS input, which surprised me. I really find them pretty similar to a Les Paul, which is a bit of what I'm trying to get away from. And the humbucker/single-coil thing:the guitar just had to have humbucker routing--the pickups I use are single-coils. (the "bucker" has a 3K dummy screw coil that just kills the noise and fattens up the tone on the 8K slug coil). And for the record--Tony Iommi's tone in Black Sabbath came from a p90 that he trimmed to fit under a humbucker cover. That and the treble booster. Try to find a used Melancon Cajun Gentleman! My mistake then, I had Strat and Tele single coil sounds in my head. 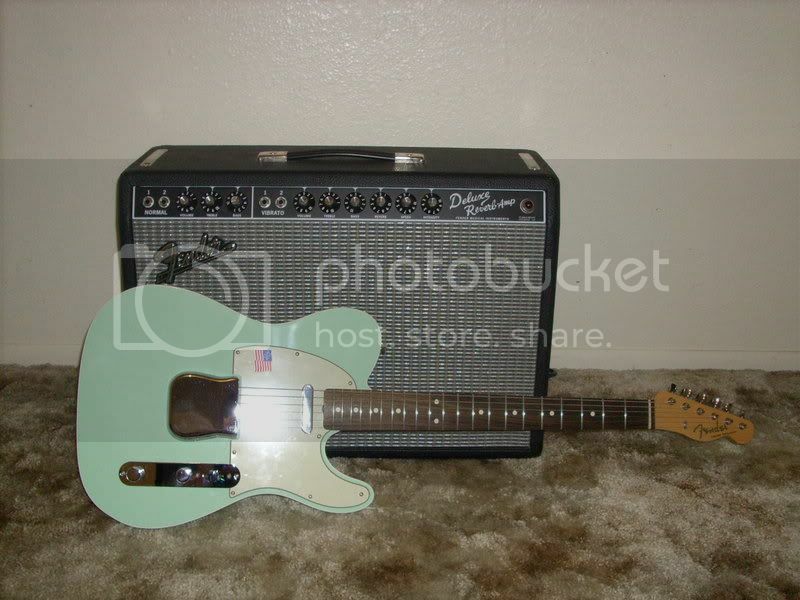 I always thought a Tele was just for twang and cleans... until I spent some time with one. I figured a Tele to be even more clean sounding than a Strat but after some time with a Custom Tele my Bro built for me. I'd say they live betweeen a strat and a Les Paul, maybe leaning more towards LP. (very rig dependant) The tone knob is the key to moving from classic twang to a throaty thick LP-ish tone. But I digress a bit. My Tele isn't a standard Tele, lots of tweeks compared to stock.